YOU can also lead a workshop! Workshops lead by registered attendee volunteers will be updated close to the event. You can continue to instigate workshops and gatherings during the weekend by signing up on the giant wall schedule in the dining hall. Maggie Hammons Parker of Pocahontas County, West Virginia was an incredible tradition-bearer, both in her repertoire (songs, banjo tunes, rhymes and stories) and her musical style. She was born at the very end of the 19th century into a legendary West Virginian musical family, the Hammonses, and was featured on recordings for the Library of Congress alongside her brothers Burl and Sherman and some of their neighbors. In this class, we will learn several songs that she sang and also listen to her vocal style and work on singing technique. Appalachia is known for its wealth of music and folk art traditions, but an integral part of that wealth is the persistent creativity of its the artists who know those traditional forms so well. We will listen to and talk about several female artists from the region who create inspiring new songs alongside the old ones, and will learn two or three songs together. In this class we sort through some of the nuts and bolts of country singing (ornamentation, delivery, feeling) to get down to the core of what it is that makes a sad, sad country song pierce so deeply into the soul. There will be the chance for some individual feedback, masterclass style, as well as plenty of chance for everyone to try out some new singing techniques on a song (or two, depending on time). Fantastic Songs and Where to Find Them! I was born and bred in the county of Somerset in England which I discovered in my teenage years was where a victorian gentleman by the name of Cecil Sharp first collected folk songs. We will have a brief look at Sharp and his legacy and (several) faults and then learn some of the first songs he ever collected, which also happen to be from just a village away from where I grew up! Olive Dame Campbell (1882–1954) has left a huge legacy in folk music, song and dance and yet her name is often forgotten or glanced over. She was born and raised in Medford, MA and went on to become a folklorist and song collector working across New England, The Appalachians and beyond. She co-published the book ‘English Folk Songs from the Southern Appalachians’ with Cecil Sharp after taking him to the songsters in the mountains. In 2000, a movie called The Songcatcher was released (loosely) based on the life and work of Olive Dame Campbell. Come and join me as we explore her legacy and learn some of the songs she collected over her long and exciting career. The bracing four part harmony singing that has come to be known as “shape-note” music is part of the lost soundtrack of nineteenth century civil rights movements beginning with abolitionism. One hundred and fifty years before the hit musical Hamilton! New Englanders of African and Algonquian descent took to the stage embodying the US Founders, including their own ancestors, in costume and song. Their music of choice included many songs still sung from The Sacred Harp and other shape-note collections. A few towns over, militant anarchist/feminist/abolitionist Henry C. Wright helped lead a group of local senior citizens in many of the same songs, and when prominent African American abolitionist David Ruggles needed music for his poem “Woman’s Right” he looked to the same tradition. Why? Come find out, while honing your vocal skills singing wonderful music with friends. Yes, there is such a thing. Taking “New England” and “ballads” as points of reference rather than hard boundaries, we will explore the generalities of solo, especially unaccompanied, singing of narrative song as well as historical and stylistic subtleties that are not often addressed (microtonal variation, singing in five beats, the origins of northeastern elites’ promotion of southern Appalachia as the heart of the “real” (white) America). This will be a repeat of a session we held last year, where attendees sang a song of emotional meaning to the singer, a song that lies just on the edge of personal comfort with emotional vulnerability, with the singers saying as much or as a little about the song and their issues with the song as they chose. A skill-building workshop. Students will find out about an approach to harmonizing where you learn little reusable snippets that can be used to harmonize lots of different songs. 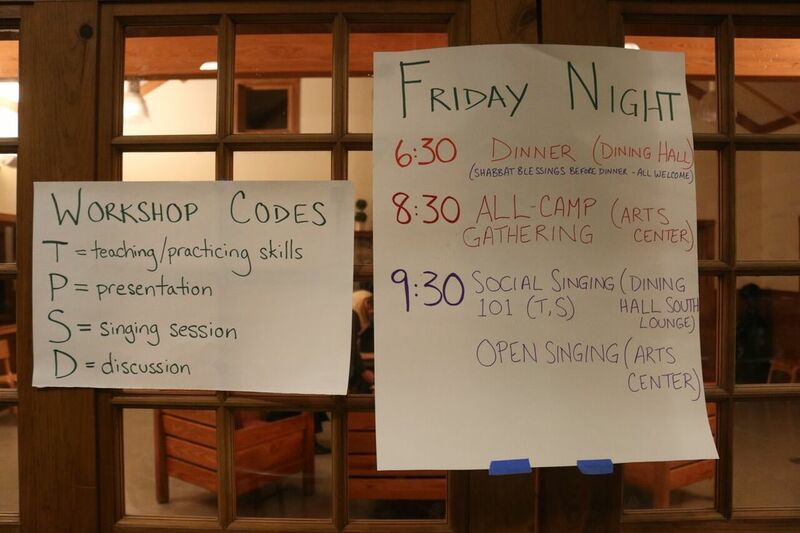 The main idea attendees can expect to get out of the workshop is that singing sea chanteys is awesome. This will be a round robin song-share - everyone who wants to will have a chance to lead. I'll bring some copies of my chantey book, and others should feel free to do so as well. Come sing songs in which men get what they deserve! All genders welcome, but people who have lived as women/girls should be the primary voices. This will be a song circle focused on sharing Irish ballads, or similar songs.